This weekend I am off to Wellington, to compete in a new tournament, run by a good mate, Bede. 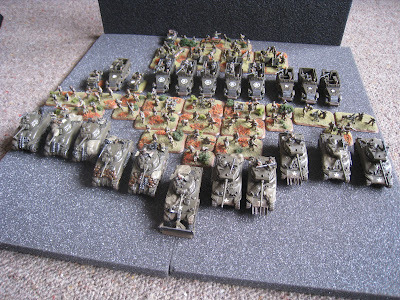 This is going to be my last tournament of the year, much to the delight of my partner who I am sure has had enough of my being away playing toy soldiers! The tournament itself is themed around the battle of Normandy, spanning the initial landings on D-Day, up until around the time the Falaise pocket closed. So, plenty of scope for some pretty cool armies, and some very cool tables. Bede has been a consitently fantastic terrain maker, and especially as a provider of pieces for a tournament, so from the "prettyness of the table" aspect, I am pretty excited. 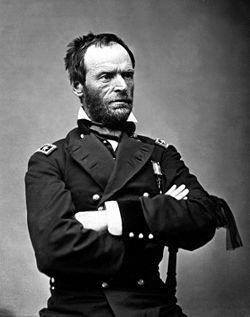 General William Tecumseh Sherman, famous general of the Union in the Civil War, especially famous for his "scorced earth" tactics against the Confederacy. So to carry on his legacy, I am bringing along a whole heap of his namesakes! 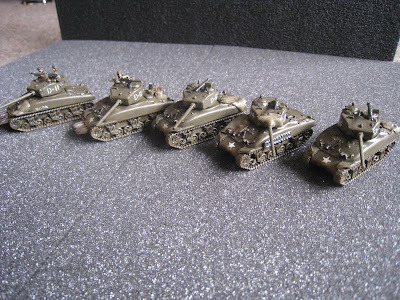 Tank Platoon- 5 M4A1 (76mm) Sherman tanks. You can see the "Speed Numbers" on the side (this platoon is D-11 through D-15) representing company, tank platoon and tank numbers. I chose Dog company naturally (get it?). I also wrote them in white (some were white, some yellow) because I could only get my hands on a white pen! 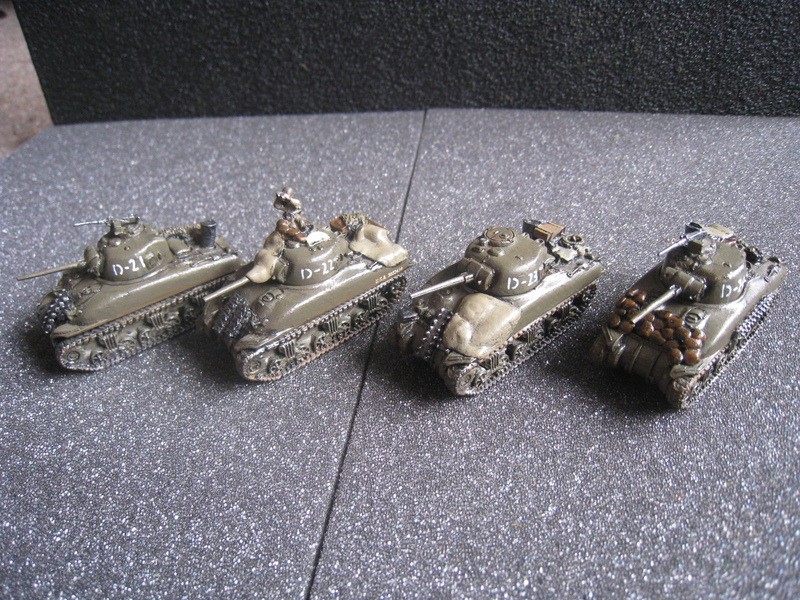 Tank Platoon- 4 M4A1 (75mm) Sherman tanks. Armoured Mortar Platoon- 2 M4 81mm Mortar Carriers with AA .50 cal MGs, and a command M3 halftrack. 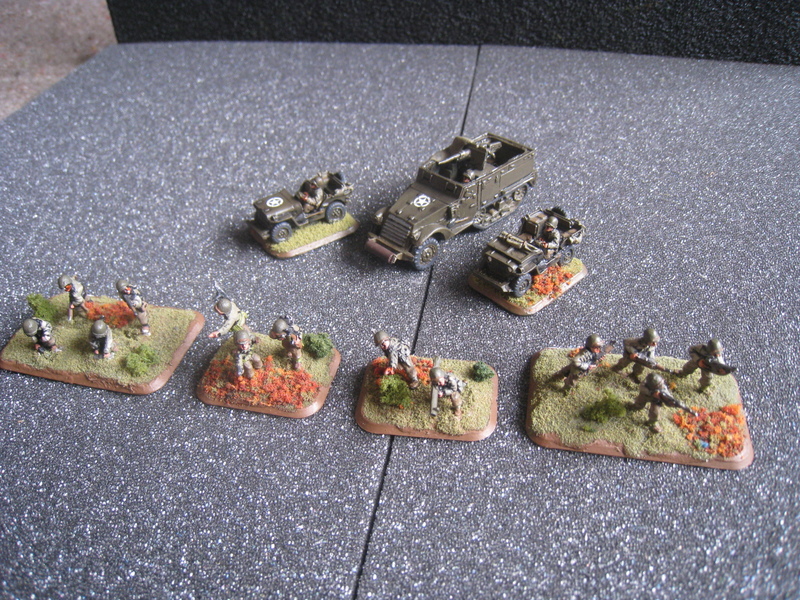 In front of them is their dismounts. 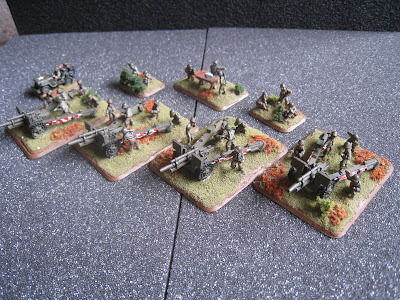 Corps Field Artillery Battery- 4 105mm guns. These guys are sadly trained (the rest of the force is vet) but will hopefully make up for their rating by bringing in the Freedom Rounds on those dirty Nazis. 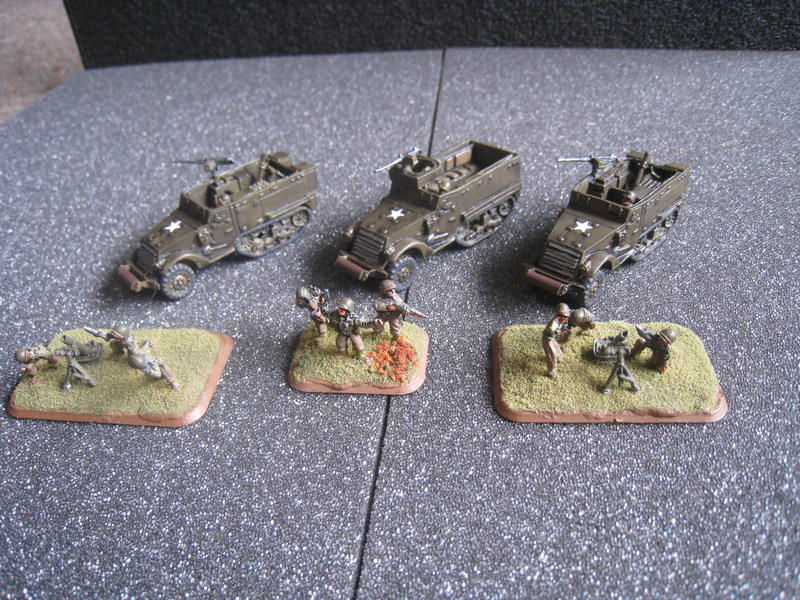 And last but not least, I have my two objectives. A wrecked M5 Stuart light tank, and my scratchbuilt Caterpillar D7 bulldozer. The bulldozer has been with this American army for a long time, I consider it a good luck charm now! 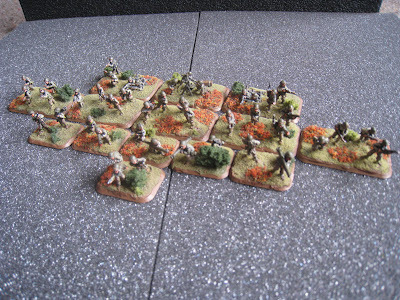 There is an extra side competition in the tournament, that is to claim scalps (head here if you dont get it), which can be done by destroying a German infantry or man packed gun team in assault! 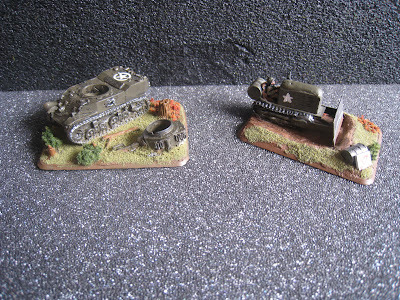 So, from now on these will be called "Patton Points", because heck, if i am assaulting Germans, I am probably following the orders of Patton! I will just have to make sure I achieve the mission, otherwise I will be in for a serious dressing down and loss of rank from the General! So, tournament starts on Saturday, I will have an update about it on Monday. 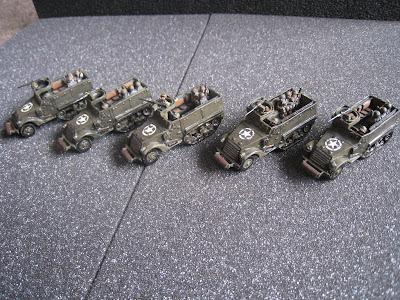 For those who read this blog for Dystopian Wars, there are new projects on the way. For those who started reading for Napoleonics stuff; sorry there has not been much lately! I will rectify that soon, promise. 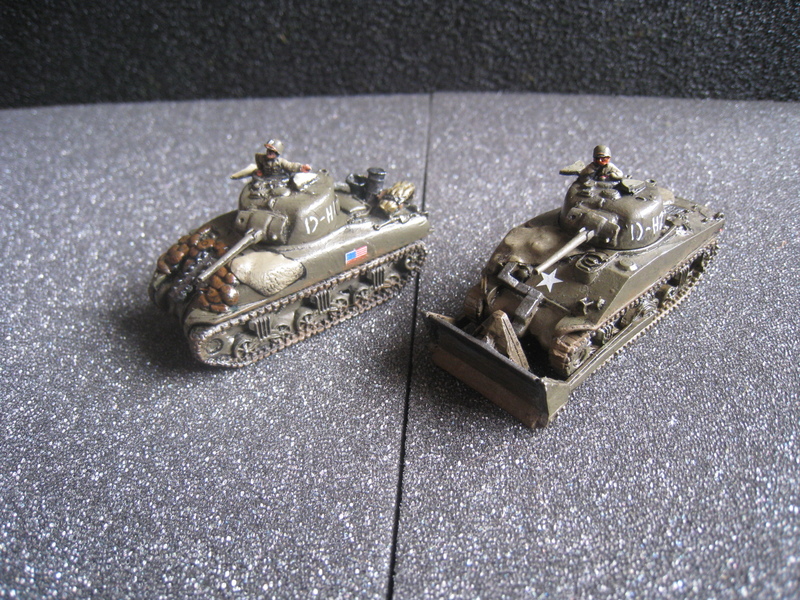 Shermans look impressive. Looking forward to the Napoleonics. Good luck for the weekend. I forgot the most important thing. Sherman was pretty badass. Get back to painting Bulgars sir! For you Rodger, there will be napoleonics next week. Promise! And you should know by now Craig, I am best with lists that shouldn't really work! Lots of tanks and guys in halftracks, love it. Good luck Craig and Pooch. Nice force, and best of luck. I am hoping to find time to pop over for a look at the tournie. 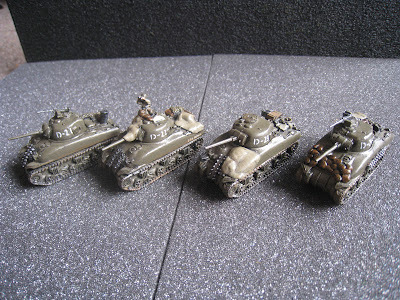 Could you please tell me what colors you use for your shermans and if you black lined them or applied a wash? These were US Armour spray, GW's Badab Black ink (no longer in production, use Nuln Oil, it works just as well) then a drybrush of Brown Violet. 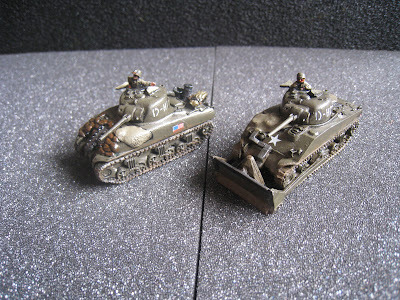 My British Shermans have blacklining, not sure why I didn't on these ones, most likely laziness. The US Armour spray comes from Battlefront, and I assume it is probably Vallejo... Never thought to ask.